The Charlotte Observer gives advice on avoiding holiday music mishaps. Specifically, they say not to play Cheech and Chong's Santa Claus & His Old Lady. Pat Morita, Mr Miyagi from the Karate Kid, passed away yesterday. His is survived by his wife, Evelyn Guerrero, Donna from the Cheech and Chong films, and three daughters. Jamime Camil, formerly in Mambo Kings, will be joining Latinologues later than expected because he's finishing filming of I Love Miami. He'll begin his role as ex-member of Menudo on December 6th. CBS 2 anchorman, Mario Bosquez, will return to Latinologues November 22nd. He will once again play a latin soap opera star just as he did during his first appearance, November 1st. Holland fans, we need your help. This person has been sending us phony money orders. Please do some research and let us know what you find out. Who is he? Contact your local authorities. Asian Week magazine interviewed Tommy Chong's daughter, Rae Dawn, about growing up with a mixed racial background, her career, as well as growing up as a celebrity daughter. On November 19th, Raul de Molina, host of Univision's El Gordo y La Flaca, will make a guest appearance in Latinologues . On November 25th, Jaime Camil, formerly of Mambo Kings, will join the cast of Latinologues . He will be portraying a new character, "ex-member of Menudo." He will remain with the production until the end of it's run. 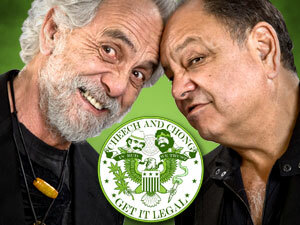 "This website, www.cheechandchongfans.com, meets our criteria for the Illegal Drugs category. Not only does the drug humor "Glamorize" using marijuana, but they include multiple banners on their sites for drug test screen beating agents and some other drug related clothing and odds-and-ends. Recipes, instructions or kits for manufacturing or growing illicit substances for purposes other than industrial usage Glamorizing, encouraging, or instructing on the use of or masking the use of alcohol, tobacco, illegal drugs, or other substances that are illegal to minors. Information on "legal highs": glue sniffing, misuse of prescription drugs or abuse of other legal substances. Displaying, selling, or detailing use of drug paraphernalia"
Sorry we can't accommodate your request, but to keep it in perspective, your customers can access your newsletter from their personal systems." Sebastian, a German Cheech and Chong fan, recently got this Cheech tattoo. He's getting his Chong tattoo shortly. Stop using Google! Google will not allow Cheech and Chong Dot Com to advertise on their site because they consider this site a "drug related." In addition, they will not allow any domain that contains the name "chong" to advertise. Apparently, ever since Tommy was arrested, they think that every Asian named "chong" is related to drugs. On the CBS Morning Show, Rick Najera revealed that Latinologues has been extended through the end of the year. That's right. It's been so popular that it's running until December 31st.